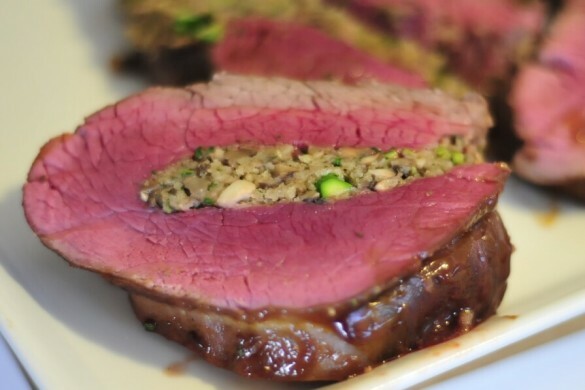 Tenderloin is one of my favorite go-to meals when I have guests over. Mr. Fits parents were in town this week and I love cooking for them. Even when things don’t go as planed, they are always impressed and gush for days over how much they loved my food. “Wow, that chicken you made the other day was really something special!” Really? The overcooked, under seasoned chicken? Well thank you. Heat the butter in a large pan over medium heat until melted. Add the onion and cook until softened, then add the garlic, cook for about 30 seconds. Add the sherry, scraping to deglaze the pan, then add the mushrooms and asparagus. If the pan starts to look too dry, you can add olive oil or more butter to moisten things up a bit. Cook, stirring frequently until mushrooms are darker and softened. Add the olive oil, and Panko and stir until it resembles a paste, salt and pepper to your liking. Cut the tenderloin down the middle, making sure not to cut all the way through and then open it up like a book. Pile the stuffing in the middle of the tenderloin, forming into a tight log with your hands. Once the twine is secure, heat the last 2 tbs of olive oil in a pan until hot and shimmery. Sprinkle all sides of the tenderloin with salt and pepper. Once the pan is hot, brown the tenderloin on all sides. It should take about 4 minutes per side, roll it until all sides are brown, remove from pan and add to a glass baking dish. In a bowl, combine hoisin and soy sauce. Brush all sides with the hoisin mixture. Cook in the oven for about 25-30 minutes or until the internal temp reaches between 130-140 for medium rare (meat will continue to cook after it is removed from the oven.) About every ten minutes during the cooking, re-brush the beef with the hoisin glaze. Remove from the oven and allow to rest for about 5 minutes. Cut into rings and serve. This was even better then these pictures. We enjoyed it very much. Thanks Dave, so great to have you both in town! sorry wrong email. Where does the sherry come in? You deglaze the pan with it. Just updated the post, thanks!